2002 Information: Elissa will be joining us once again for our 20th Annual doll show this October 11th and 12th. Email us at kmalone@dollery.com to receive a free color catalogue highlighting the show, Elissa's work and over 25 other world renowned doll artists. Our show is the longest running doll show in the United States.. Elissa will be working on some one-of-a-kind work and hopefully an exclusive limited edition resin just for the Dollery. We were very pleased to have Elissa attend our last five shows. This year Elissa did just a few dolls for toy fair in editions of just 3! They are beautiful. We especially loved the girl with the copper hat in orange! 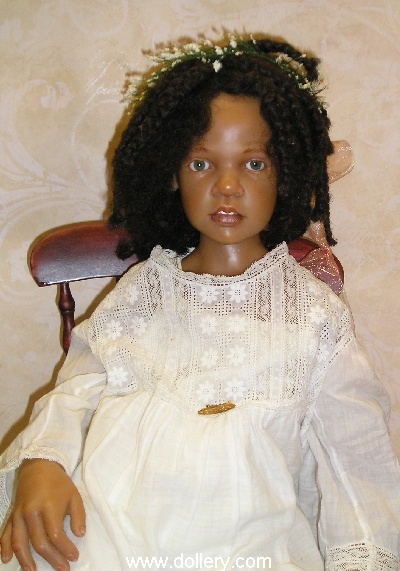 Elissa also sculpts for Zapf and we thought this year's African American girl "Alicia" was just beautiful! Last year Elissa did only three limited edition dolls all dressed in cotton jacquards and silk in a style typical of the mid 1700s. These are the best large dolls we have seen from her in years and they are reasonably priced. Elissa says she was inspired by an author of young people's literature whom she has greatly admired. The girls are suppose to represent the court children of a fantasy kingdom beset with intrigue and mystery. All the dolls have full shoulder plates and wire armatures under cloth bodies. They are extremely limited to just 8 of each doll! Our Dollery favorites are Cleofe and the Asian girl Orlanda and we have one left of each. She did not do any smaller sized limited edition dolls. We do have just two left from past year's lines. Asian Child. He is about 27", cloth body, painted eyes, made of cernit/fimo. 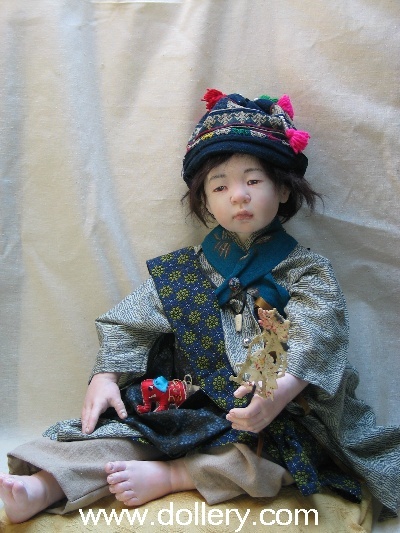 He has a mohair wig, and costume is made from vintage fabrics. He has a shoulder bag for his shadow puppet and toy elephant. 2005 Lil Sis - Prototype $3,700 (above) SOLD She carries a little dolly with a basket. Red mohair, blue eyes. Limited Edition of just 5, Ours is an Artist Proof. Sold out edition to dealers. We have just one left. Taking order. Email kmalone@dollery.com for further details. Limited Edition, resin. Email kmalone@dollery.com for further details. Call on availability. Email kmalone@dollery.com for further details. Limited Edition of just 5, Call on availability. Email kmalone@dollery.com for further details. Ltd to 750, 26 inches/65 cm, has a Kanekalon wig, real eye-lashes and synthetic eyes. Her body incorporates a wire frame, allowing her arms and legs to be flexible. The integrated breast plate ensures the head has a natural posture. Alicia is a lovely Ethnic addition to the Designer Collection. She is wearing a cream colored mesh dress with a striped chiffon overlay. She is sporting real leather sandals and has an Ethnic fabric doll accessory. $600.00 - Taking orders now with a deposit of just 25% down, balance due when in. We will work with you on extended layaway. Email kmalone@dollery.com or call 800-447-3655 ext 15 or ext 0 out of state or 781-447-6677 ext 15 or ext 0 in Ma. Ltd to 750, 26 inches/65 cm, has a Kanekalon wig, real eye-lashes and synthetic eyes. Her body incorporates a wire frame, allowing her arms and legs to be flexible. The integrated breast plate ensures the head has a natural posture. This red-headed beauty is delicately dressed in a light brown colored mesh dress with a chiffon overlay. Gianna is sporting real leather sandals and carries with her a fabric doll. Limited Edition of just 8, 31 inches, resin, full shoulder plate and wire armature under cloth body. Dressed in cotton jacquards and silk in a style typical of the mid 1700's. We are taking orders now against our order ( Sold out nationally to dealers). We have one left. A deposit of 25% down is required, balance is due when the doll comes in. Estimated ship scheduled for October 2001. We can work with you on extended delivery dates. Email kmalone@dollery.com or call 781-447-6677 ext 15 in Ma or 800-447-3655 ext 15 out of state. Ella for 2001 - Dollery Favorite! Ltd to year production of this outfit, 21 inches, vinyl. She has a Kanekalon wig, real eye-lashes and synthetic eyes. Her body incorporates a wire frame, allowing her arms and legs to be flexible. The integrated breast plate ensures the head has a natural posture. Ella is a dark-skinned beauty and is dressed in a white linen pant with natural coloured trim. She also wears a white, asymmetrically cut linen shirt. Like all Zapf Creation Designer Dolls, Ella is accompanied by a certificate and bears the number and signature of the artist. This photo was taken by our store. Ltd to 850 worldwide, 31 inches, vinyl. She has a Kanekalon wig, real eye-lashes and synthetic eyes. Her body incorporates a wire frame, allowing her arms and legs to be flexible. The integrated breast plate ensures the head has a natural posture. Maidie is dressed in a white, Chinese-style linen dress with stand-up collar and passement fastening. She also wears a pearl necklace and matching pearl hair slide. Maidie’s accessory is an organza bag with blossom embroidery. 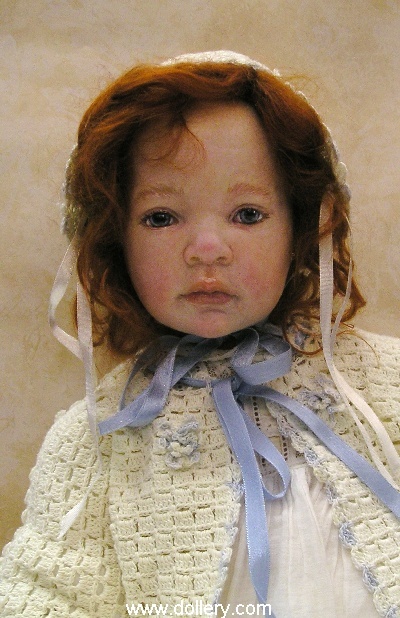 Like all Zapf Creation Designer Dolls, Maidie is accompanied by a certificate and bears the signature of the artist. This photo was taken by our store. Ltd to 850 worldwide, 35 inches, vinyl. She has a Kanekalon wig, real eye-lashes and synthetic eyes. Her body incorporates a wire frame, allowing her arms and legs to be flexible. The integrated breast plate ensures the head has a natural posture. Gwen is dressed in an old-rose Empire-style chiffon dress over which she wears a delicate little jacket with flared sleeves. She also wears lace-up sandals tied with velvet ribbons. Like all Zapf Creation Designer Dolls, Gwen is accompanied by a certificate and bears the signature of the artist. This photo was taken by our store. One of a kinds SOLDBlonde Child, Asian Child, African American Child - One of a kinds - Cernit, Handmade Eyes, 20 Inches - $1,800.00 each. Introduced at our October doll show! Asian and African American - Sold. Call on Caucasian. Ltd 20 Sculpt, Ltd 10 outfit - Resin & glass eyes, 12 inches. Just adorable and a great price! Introduced for the first time at our October doll show! 9" Ethnic Baby - in Fall Introductory outfit - Dollery favorite! Ltd 20 Sculpt, Ltd 10 outfit - Resin & glass eyes, 9 inches. Just adorable and a great price! 9" Ethnic Baby In green - Dollery favorite! Ltd 20 Sculpt, Ltd 10 outfit - Resin & glass eyes, 9 inches. Just adorable and a great price! 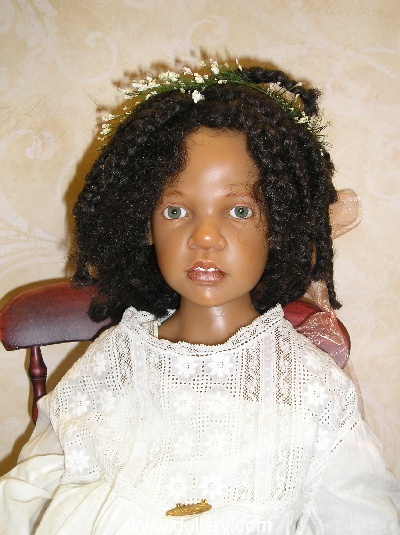 12" Ethnic Toddler in Green - Dollery Favorite! 15" Girl - Dollery favorite! Ltd. 20 Sculpt, Ltd 10 - Resin - 15"- Sold out nationally -call. Ltd. 20 Sculpt Ltd 10 outfit - Resin - 15" - Notice New Hair Style! Ltd. 20 Sculpt, Ltd 10 outfit - Resin - 12" glass eyes. Ltd. 20 Sculpt, Ltd 10 - outfit - Resin - 9" glass eyes. Ltd. 20 Sculpt, Ltd 10 outfit - Resin - 9" - glass eyes. Ltd. 10 - Resin - 25" glass eyes. Vinyl - Beautiful! Dollery favorite! Ltd 20 - Resin & glass eyes with teddy - 14" - Just adorable and a great price! Sold out nationally. We have two available. Ltd. 10 - Resin - 30" - Full shot coming. Br. mohair & glass eyes - Cotton embroidered gown. Ltd. 10 - Resin - 28" - Full shot coming. Bl. mohair & Bl. glass eyes - Organza embroidered gown. Ltd. 20 - Resin - 34" - Full shot coming. Br. Human Hair & Glass eyes - Cotton embroidered gown. Ltd. 20 - Resin - 12" - Full shot coming. Ltd. 10 - Resin - 18" - Full shot coming. Resin - glass eyes. Full shot and further information coming. 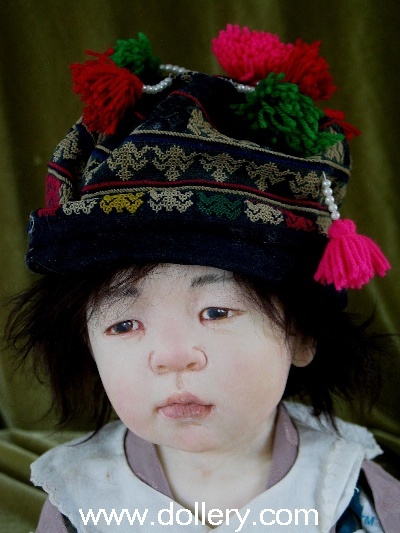 Ltd. 30 - Resin - Human hair, glass eyes, chair, hat and bear - 21"